One of my favorite holidays is coming up soon. If you have been following me over the years, you know it’s not just the traditional holidays, but a very special one – Beethoven’s Birthday on December 16th! December (or any month, really) is a great time to spend some time listening to some of his music. Start with something you are familiar with, say Fur Elise or the familiar theme of the Fifth Symphony. Listening to music together with your class is a wonderful experience that can build community and even better, you can use these listening experiences to integrate with other areas of the curriculum. For example, you could listen to Beethoven’s Coriolan Overture and have the students come up with a main character, setting and plot to develop a story. Another great piece for this would be the Egmont Overture. Both are just over 8 minutes and may be too long to listen to in class, however listening to an excerpt is a great way to get a feel for the piece and inspire a great storyline. And if you go this far, you can certainly set up a listening station to allow students to listen to more. What can be even better, is when a student searches for these pieces on their own time and invests their own time listening to the music at home! 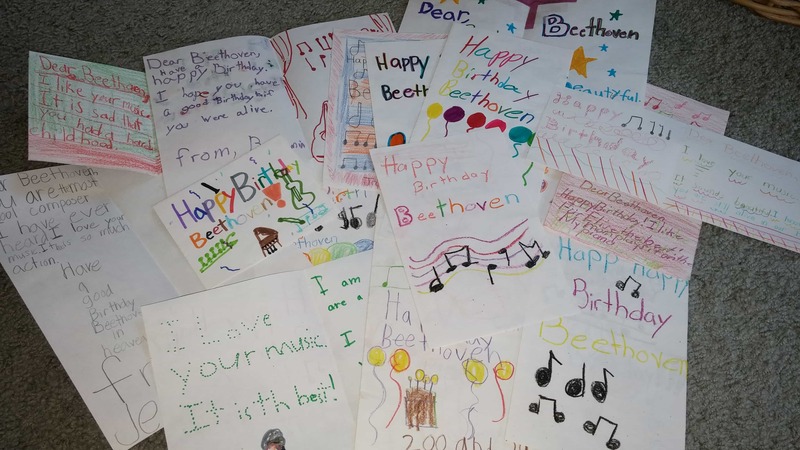 Another thing you can do is invite your students to share their own artistic and creative talents on Beethoven’s birthday. In past years, I have had students sign up to perform Beethoven’s music at an All-Beethoven Recital. Students can perform on their recorders or a keyboard, and some even may want to write their own poetry and rap about the man and his music. 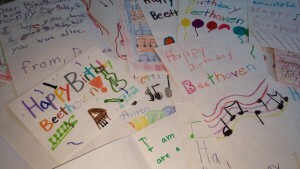 A nice and easy activity to do to celebrate Beethoven’s birthday is to make birthday cards! This is always a favorite for students who have been learning about the man and listening to his music. These are some examples from a few years ago. 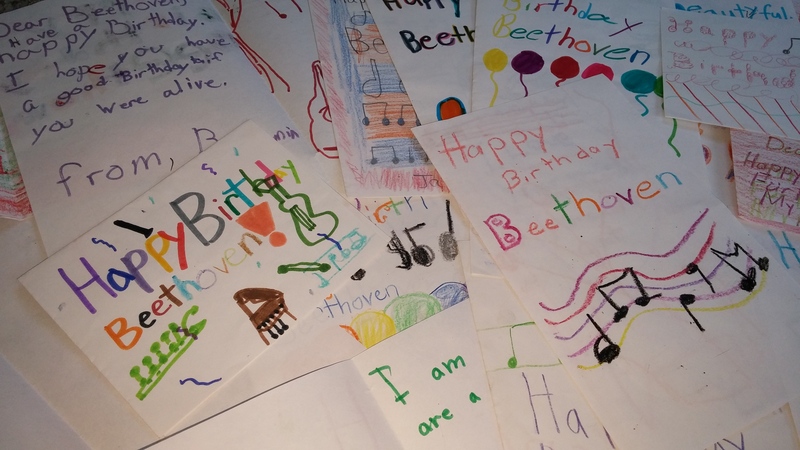 I asked students to make these cards and they really got into it, especially when they learned I would not only display them, but then share them with my grandfather who was my inspiration to admire Beethoven and his wonderful music. There are so many reasons to celebrate and create great things this month. 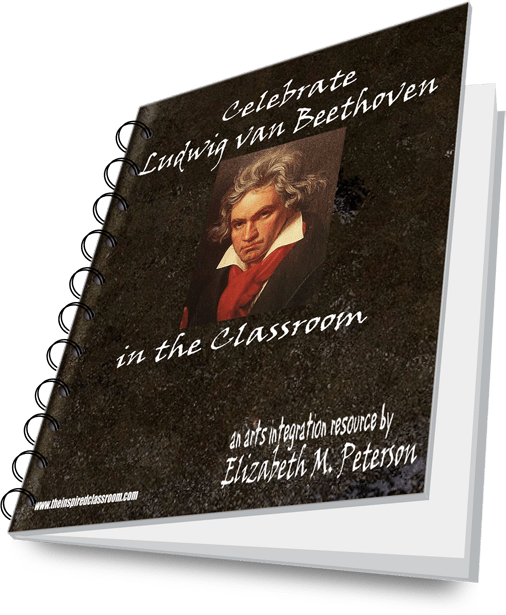 Don’t let it pass by without a fun activity that celebrates one of the greatest composers! Fraction Rhythms - Integration, Collaboration and JOY!